From its idealistic 1971 roots in a San Francisco church, to its current status as a national force and champion of consumers, Consumer Action has stayed true to its mission of consumer protection and education into the digital age. In June 1971, a few volunteers set up Consumer Action’s first office - a telephone being its most memorable element - in a nook donated by a San Francisco church. 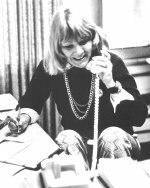 Kay Pachtner, student activist and housewife, organized the fledgling group around the consumer complaints that began to deluge Consumer Action’s first hotline. “We saw what Ralph Nader was accomplishing and we wanted to join the consumer movement,” Pachtner recalled. The individual problems she listened to soon revealed a bigger picture: the strong taking advantage of the weak. Pachtner and crew added a mobile complaint unit in an old van and irreverent public protests to their arsenal. The feisty group found an eager partner in the press. “We had media attention from the get-go,” said Pachtner. Consumer Action’s ability to focus equally on the little and the big picture is a key element of its evolution, staying power, and growth. Forty years after its inception, Consumer Action’s complaint hotline is still answering individual complaints, and using that information to change the system through education, legislation, and legal action. 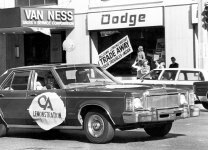 November 1975: Consumer Action holds the famous “Lemonstration” in San Francisco to protest resale of defective autos. It was an individual complaint that brought notice to Consumer Action a short time after its founding. Aligning itself with a woman who had bought a used Jaguar that kept breaking down, Consumer Action set up a picket line in front of San Francisco’s posh British Motors. The car dealership let loose a barrage of high-priced lawyers, who hit the consumer advocates with a $6 million lawsuit. “Six million?” said Pachtner in disbelief. “We haven’t got six cents.” In the end, Consumer Action won the case, and the right of aggrieved consumers to picket businesses was established. In 1974, Consumer Action took aim with a scathing indictment of the California consumer affairs department. Once again, people and politicians sat up and took notice. The expose, titled “Deceptive Packaging,” revealed that the board of this supposedly pro-consumer government agency was in fact made up of state-licensed trades people, the very group it was meant to police. “Deceptive Packaging” turned a spotlight on the agency and its $21 million budget and made it more responsive to the needs of consumers. 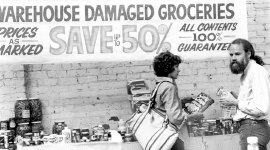 Consumer Action’s Catherine Johnson and Ken McEldowney put a dent in the sale of food in damaged packages at a San Francisco store in September 1975. Consumer Action continued to publish surveys, spotlighting the price of prescription drugs, bank accounts, credit cards, gasoline, and parking garages, and exposes of the food industry and the need for nutrition labeling. Consumer Action News, the group’s newsletter, has been published regularly since the early 1970s. In the mid 1970s, Consumer Action’s work expanded to include not only complaint handling, protests, and surveys, but also reform through legislation, regulations, and lawsuits. High profile protests like the 1975 “Lemonstration” - a parade of new cars that didn’t work right - brought publicity to consumer concerns. The group filed a false advertising complaint against Bank of America in 1976, resulting in a large penalty for the bank. In 1976-77, Consumer Action helped the Federal Trade Commission draft new consumer protection regulations. 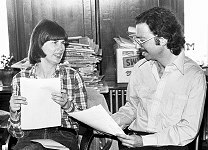 Longtime staff member Michael Heffer holds a planning session with staffer Connie Casey in 1978. Pachtner and Gendel left Consumer Action in the late 1970s. Ken McEldowney, an early staff member, returned as executive director in 1980. McEldowney, a former consumer reporter and a founder of the well-respected San Francisco group Media Alliance, ushered Consumer Action into the 1980s with a new outlook on whom the organization could help. In the ‘80s, Consumer Action began to realize that there were constituencies that were not being served by consumer groups. There were the growing numbers of low income residents - people who did not have access to the advice of lawyers and accountants. The senior population was increasingly the target of unscrupulous marketing tactics and scam artists. The disabled had needs that weren’t being addressed. And the face of California was changing, with new citizens arriving from all over the world. Many of the immigrants lived on low incomes, did not speak English well, and were unfamiliar with the United States, making them easy targets of economic warfare. 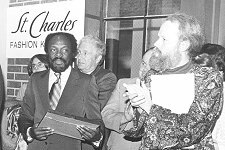 San Francisco Mayor Willie Brown (then Speaker of the State Assembly) prepares to present an award at a Consumer Action fundraiser in 1976. Recognizing a new area of advocacy and education, Consumer Action began to provide these consumers with free, easy-to-read surveys, guides, and fact sheets in English and seven other languages. By the early 1990s, Consumer Action was distributing more than one million pieces of information at no charge in California each year. A key element of the plan to reach communities of color and persons with limited English speaking ability is Consumer Action’s multilingual employees, who handle consumer complaints in Spanish and Chinese, as well as English. Bilingual outreach staff based at Consumer Action’s Los Angeles and San Francisco offices work with an expanding network of 1,900 community-based organizations around California to educate consumers and to identify emerging problems and trends. Deregulation of the telephone and banking industries created additional problems and concerns for consumers in all walks of life. Helping consumers deal with these complex issues led Consumer Action to a new focus in the fields of banking, finance, and telecommunications. In 1989, Consumer Action’s Telephone Information Project was set up to provide community agencies and individual consumers with free information about telecommunications services. The project was funded through the Telecommunications Education Trust established by the California Public Utilities Commission from a $16.5 million dollar penalty against Pacific Bell for marketing abuses that occurred in 1985-86. Like other Telecommunications Education Trust grantees, Consumer Action offered its clients a basic understanding of the increasingly complex and ever-changing world of telephone services. In its first four years, the project distributed more than three million free publications. The Telephone Information Project produced a number of fact sheets and guides to phone services, including the notable “Telephone Users Guide,” an in-depth compendium that was updated four times from 1990-1995. The 300-page guide, written by Consumer Action’s longtime staff member Michael Heffer, covers phone usage in detail, from telemarketing fraud to privacy protections to technological developments. All of the materials created by Telecommunications Education Trust grantees are housed and distributed by a consumer resource center at Consumer Action’s San Francisco office. The Consumer Action News staff took a lighthearted approach to the 1994 banking survey, which included instructions on how to write a check. In July 1993, Consumer Action launched an innovative Credit & Finance Project to identify and address credit and finance problems in California. The project placed its main focus on the concerns of low income, minority, immigrant, and senior consumers. The project was funded by court-assessed (cy pres) penalties against Wells Fargo Bank, for charging customers excessive credit card fees. The emphasis of the Credit & Finance Project was on advocacy. It operated Consumer Action’s free consumer hotline and produced and distributed fact sheets and statewide pricing surveys. The Advocacy Report, a quarterly newsletter intended to inspire action to promote change, debuted in the winter of 1993. Consumer Action’s Neil Gendel (center), who helped the city of San Francisco write its model ordinance to protect children from lead poisoning, joined S.F. 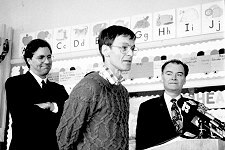 Supervisor Kevin Shelley (left) and former mayor Frank Jordan at the 1992 bill signing at a local day care center. The project also coordinated action through its Advocacy Network of community-based organizations and regular Advocacy Alerts. Members of the network are encouraged to present a unified voice for consumers on legislative and regulatory matters. The Lead Poisoning Prevention Project & an Office in L.A. The early 1990s brought Neil Gendel back to Consumer Action, as director of the Lead Poisoning Prevention Project, which focuses on preventing lead poisoning in children. In 1994, Consumer Action opened its Los Angeles office, directed by Cher McIntyre. Under Ken McEldowney’s direction, Consumer Action moved beyond the barricades and into the board rooms. Whereas the group’s contact with business and industry had been totally adversarial in the ‘70s, McEldowney found that during the Reagan-Bush years it made more sense to also work with selected corporations rather than to depend just on regulatory solutions. In particular, the corporate world responded to Consumer Action’s emphasis on consumer education, and corporate-funded national educational contracts became a new source of funding for the group. Through a coalition of community-based organizations, Consumer Action’s Healthy Children Organizing Project (formerly the Lead Poisoning Prevention Project) works to protect San Francisco’s young children from preventable diseases caused by environmental hazards. 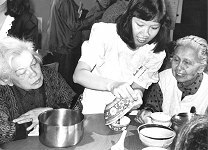 Here, onlookers are shown how to test if dishes are decorated with lead glazes. In the 1990s, Consumer Action’s focus and influence grew steadily on a national level. Its network of community-based organizations had expanded to include 400 groups outside California, distributing multilingual publications around the United States. Consumer Action’s expertise in the areas of banking, finance, and telecommunications, born during the federal deregulation of the 1980s, gave the group an authority that brought it to the table with Congress and federal government agencies such as the Federal Communications Commission and the Federal Trade Commission, as well as the national media. 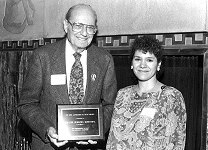 June 1994: Consumer Action’s Anna Alvarez Boyd presents Consumer Action’s annual award for outstanding consumer protection efforts to state Senator Herschel Rosenthal. McEldowney, noting that Consumer Action had carved out a niche with its work with low income and limited-English-speaking consumers, made national expansion a priority in the 1990s. In an effort to provide greater access to its publications, the organization opened its National Consumer Education Resource Center in 1995. For the first time, these free materials also became available online: The organization launched its first website in 1996. Eventually, Consumer Action News, the annual credit card survey, the organization’s press releases, consumer resources and more were added, making www.consumer-action.org a one-stop shop for consumer news and information. Consumer Action’s outreach staff conducted workshops in several cities to train members of its growing community agency network on how to use Consumer Action’s materials to educate their clients about their consumer rights. This marked the birth of Consumer Action’s multilingual, multicultural community education model in which financial literacy materials and trainings are offered free to community-based organizations nationwide. 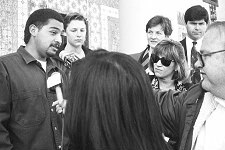 Consumer Action’s Jose Perez explains to reporters how the organization conducted its groundbreaking 1994 Youth Banking Survey. During its first 25 years, Consumer Action achieved a balance of education and advocacy and gained a lot of attention for its innovation and effectiveness. It also grew considerably as an organization, from a mainly volunteer group to an organization with a professional staff of 17 — both full-time and part-time — and a budget of $900,000 in 1996. 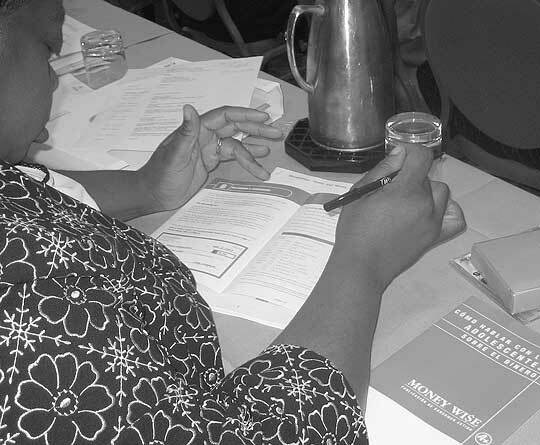 A participant at a MoneyWi$e train-the-trainer event works on a classroom exercise for the Talking to Teens About Money module. During the next 10 years (1997-2006) Consumer Action’s network of community-based organizations (CBOs) grew to 8,000 and distribution of free educational materials reached two million per year. The success of Consumer Action’s education model helped the organization to obtain new grants and contracts, including one from the U.S. Treasury Department to educate agencies and individuals about regulations for new mandatory electronic payments of government benefits. Another government contract for $2 million from the U.S. Department of Housing and Urban Development (HUD) tasked Consumer Action with helping shape a national education campaign about housing discrimination and how to fight it. In November 2001, Consumer Action and Capital One launched their MoneyWi$e partnership, which will mark its 10-year anniversary in 2011. To date, the multi-million outreach program has produced 12 modules and distributed millions of pieces of educational literature on housing, banking and credit-related subjects. According to Executive Director Ken McEldowney, Capital One's extraordinary philanthropy has allowed Consumer Action to build a nationwide network of community-based organizations engaged in consumer education and financial literacy that serves as a model for the way financial empowerment outreach efforts should work. Under the partnership activities, Consumer Action also built and maintains the MoneyWi$e website. Also in 2001, Consumer Action, working with the Sturdevant Law Firm in San Francisco and Trial Lawyers for Public Justice, was the lead plaintiff in lawsuits against Bank of America and AT&T. Our victory in those cases struck a blow to mandatory arbitration clauses in banking and telecommunications, which deny consumers the right to sue in court and essentially immunize companies from most liability. In 2005 and 2006, Consumer Action was chosen to receive several cy pres funds resulting from lawsuits, plus two large funds created for the purpose of educating California consumers about insurance and housing issues. With these added projects, Consumer Action’s annual budget rose to about $2 million, and the organization moved to larger offices in downtown San Francisco, at 221 Main Street. 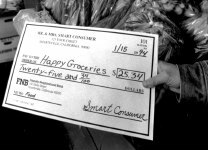 Consumer Action found itself in the gratifying position of being able to award roughly $200,000 in small grants in 2006 to members of its community organization network. This marked the birth of a unique “mini-grants” program allowing Consumer Action to support innovative education and outreach efforts by select community organizations in its network. Projects funded with Consumer Action grants include a hands-on money management field trip for low-income teens and their parents in Florida; the production of a money management video for the Hispanic community to publicize a Southern California credit union; and money management education for grandparents raising grandchildren in Texas. Advocacy remained a priority, with Consumer Action staff regularly speaking out before the media - both mainstream and ethnic - on a wide range of issues, including those related to auto repair and leasing, electric energy deregulation, identity theft, privacy, Medicare, Internet frauds and data security. To boost its effectiveness, in 2004 Consumer Action established an office in Washington DC, headed by Linda Sherry, a Consumer Action staff member since 1994 and now the organization’s director of national priorities. Well aware of the expansive reach of the Internet and its effectiveness as a tool to educate and mobilize mainstream America and marginalized constituencies alike, Consumer Action set out to build a unique family of consumer-focused websites. Updated daily, the main Consumer Action site (www.consumer-action.org) now offers a more robust visitor experience, including headline consumer news, book reviews, an online “help desk,” and access to the Take Action advocacy database of national, state and local elected officials. The site attracts more than half a million unique visitors per year. New topic-specific sites launched since 2002 focus on financial literacy (the Managing Money Project), housing (the Housing Information Project), privacy (the Privacy Information Project) and insurance (the Insurance Education Project). Funding, originally from MCI and subsequently from SBC, Verizon and Microsoft, enabled Consumer Action to create a unique and comprehensive multilingual consumer education website, with landing pages, news and materials available in Spanish, Chinese, Vietnamese, Korean and several other languages. In the year ending March 31, 2009, the Help Desk responded to 3,950 calls and emails on everything from credit cards and collection agencies to home loans and identity theft. We distributed 1,278,879 free publications to 2,153 CBOs nationwide, and outreach staff trained 1,115 CBO staff members in 350 cities on the effective use of our materials in their communities. An online ordering system implemented in 2010 enables community organizations to quickly and easily order materials. 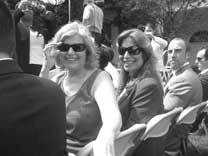 Consumer Action’s Ruth Susswein and Linda Sherry (front) attend the signing of the CARD Act in the White House rose garden in May, 2009. Nationally known for its expertise in a wide range of issues and with almost 40 years’ experience in managing national media and community outreach campaigns, Consumer Action has been selected by plaintiff attorneys, courts, and grant-making organizations to receive cy pres funds totaling more than $4 million. Government agencies, Congress and national citizens organizations, too, look to Consumer Action when working on important issues of legislation and regulation. In 2008-2009, Consumer Action helped mold the historic Credit Card Accountability, Responsibility, and Disclosure (CARD) Act, which curtailed many of the practices that card companies long relied on to boost profits and keep consumers in debt. The organization’s “Take Action” email alerts mobilized consumers to send nearly 3,000 emails to Congress in support of the bill, which ultimately became law in May 2009. Consumer Action maintained the momentum through 2010, when, after actively championing the creation of an independent, pro-consumer federal agency to oversee banks and financial companies, Congress established the Consumer Financial Protection Bureau. And, together with coalition partners, Consumer Action worked to change the law to make it a consumer’s choice - not the bank’s - to enroll in high-cost automatic overdraft protection programs. At the same time it was contributing to new legislation and regulations to prevent future abuses by financial services companies, Consumer Action also was busy finding ways to protect those hardest hit by the housing crisis and recession and most likely to look for help in the wrong places. Consumer Action helped people stay in their homes through mortgage modification education and by joining the fight for the right to modify a home loan with a bankruptcy court judge’s approval. Online and offline, Consumer Action alerted and educated consumers about foreclosure prevention scams, fake check fraud, work-at-home schemes, government stimulus money scams and other types of fraud that targeted those most desperate for assistance. With the number of foreclosures at record highs, Consumer Action’s free national hotline handled a 371% increase in calls related to mortgages. The group also worked on comments to the Federal Trade Commission regarding debt settlement services and issued a joint consumer advisory on debt settlement with other national consumer groups. This work helped influence the FTC regulations of October 2010 that prohibit for-profit debt relief companies from making misrepresentations about results or charging a fee before they settle or reduce a consumer’s unsecured debt. In just a few short years of arriving in DC, Consumer Action became an active player in many consumer-protection battles. The organization drummed up grassroots activism among its constituents in support of health insurance reform, and worked with fellow national consumer organizations Public Citizen and Consumers for Auto Reliability and Safety to force the government to implement rules for a consumer-accessible national database of rebuilt wrecks, called the National Motor Vehicle Title Information System. On Jan. 30, 2009, the NMVTIS began allowing consumer access to online vehicle histories, providing them with the information they need to make informed financial and safety decisions about their cars. In 2009, we updated more than 320 publications in multiple languages; fulfilled over 2,300 bulk orders for about 630,000 publications; sent 813 solicitation letters to community-based organizations across the country asking for feedback on our materials and trainings; and sent 53 advocacy alerts, which generated 17,051 emails and 462 phone calls to policymakers from our active subscriber list of 19,600 people. We also published the first of our annual reports. 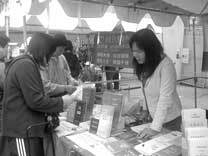 Consumer Action's Cui Yan Xie staffs the Consumer Action booth at an Asian community street fair. Consumer Action enters its fifth decade as the foremost expert in designing and delivering multilingual, multicultural consumer education; an active and effective advocate for consumer rights; and a major contributor to pro-consumer regulation and legislation. While our mission remains the same - to help consumers guard their hard-earned money - the issues we tackle change with the times. The growing incidence of data breaches has turned Consumer Action’s attention increasingly to digital and health privacy issues. By December 2009, our DC office had grown to four staffers. Our staff helped launch a report card for online personal health records; advocated for stronger patient privacy protections at the World Congress 2nd Annual Leadership Summit on HITECH and HIPPAA Compliance Management (health information technology) in February 2010; and attended other key conferences, including the Transatlantic Consumer Dialog in Brussels, Belgium. The organization also provided critical small grants to 15 California CBOs to help them provide practical, privacy-related education and information to their communities. Our Privacy Information Project continues to attract new visitors with its unique mix of consumer education materials and breaking news. Beyond 2010, Consumer Action’s goals include strengthening relationships with our national non-profit network and our supporters; engaging more individuals and organizations in our legislative work; evaluating and enhancing our education programs and materials; taking steps to ensure our “branding” reflects the national scope of our work and diversifying our funding and implementing a more user-friendly donation system. After 40 years Consumer Action looks quite different with three offices, a staff of 24 and a budget of $3 million in 2010, and as a sign of the times, a Facebook page and an active Twitter account!